Why are cuts being inflicted on the poorest in society while the enormous wealth generated through the ownership of land goes untaxed? How can we secure a new deal for the countryside post-Brexit? How can society support people who develop dementia? How can we increase the freedom to explore our countryside and improve facilities for access for people with disabilities? What can you do to enjoy a happy and healthy later life? These are the kinds of questions to which you may find answers here. Two areas concern me: conflicts over the use of Britain's land, and older people's issues. In each of these fields I have spent years finding out the facts and campaigning for change. In both areas I write books and articles, take part in TV and radio interviews and phone-ins and give talks - at conferences, meetings of voluntary organisations, book festivals and to students. 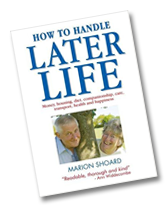 On September 1st, Marion's new book, How to Handle Later Life, was published by Amaranth Books. Running to 1160 pages, it is a comprehensive guide to every aspect of ageing, from retirement housing to hospitals, equity release to dementia care. How to Handle Later Life is available from bookshops, Amaranth Books and from the distributors, Central Books. two sample chapters on the website of the publisher. My interest in countryside conservation was first fired while I was studying zoology at Oxford University. At first, wildlife conservation and the conservation of the world's natural resources were my main concerns. After working for four years for the Council for the Protection of Rural England (CPRE) in the mid-1970s, I left to investigate the impact of modern farming on the wild plants and animals of the English countryside. However, this investigation soon also embraced the impact of modern farming on the landscape and historical value of the countryside. I talked to people in towns and villages whose lives had been affected by unrestrained landscape change wrought by modern farming, as well as to farmers themselves, landowners and specialists in wildlife, archaeology and public policy on agriculture and on town and country planning. These investigations yielded my first book, The Theft of the Countryside. This examined the damage already caused and urged radical measures to prevent further destruction. Land ownership in the UK - who owns the land and the powers which the law allows them absorbed my thoughts over the next few years and in 1987 my book This Land is Our Land. This proposed a new social contract between landowners (public and private) and the wider population, including the introduction of a 'right to roam'. This Land is Our Land was published in tandem with a Channel 4 programme, Power in the Land, which I presented. During the 1990s, I held lecturing posts in rural planning at University College, London and Reading University. Gaia Books reissued This Land is Our Land as a Gaia Classic in 1997. In my third book, A Right to Roam (1999), I turned again to the idea of greater freedom to roam over the countryside. I examined the struggle over rights of access to Britain’s countryside over the past 1,000 years, looked at the ways in which alternative access systems overseas operate and put forward a detailed plan of how a general right of access on foot to the countryside of the UK could take shape on the ground. The Sidney Perry Foundation, The Leverhulme Trust and the Nuffield Foundation have funded my research into landscape change and countryside access over the years. I campaigned for improvements to what became the Countryside and Rights of Way Act 2000 (for England and Wales) and the Land Reform (Scotland) Act 2003, just as I had twenty years before to what became the Wildlife and Countryside Act 1981. In recent years I have become interested in what may be the most distinctive yet maligned landscape of our time: the edgelands – that is, the hotchpotch collection of superstores, sewage works, golf courses and surprisingly wildlife-rich roughlands which sit between town and country in the urban fringe. A Right to Roam and an essay entitled 'Edgelands' have both won awards from the Outdoors Writers and Photographers Guild. In 2006 I was voted one of the top 100 most influential environmental activists by The Guardian. In 2009 the Outdoor Writers and Photographers Guild presented me with its Golden Eagle Award for a lifetime's achievement in the world of the outdoors. In September 2016, Marion appeared on BBC Breakfast to discuss the future of the countryside, including agricultural subsidies and recreation opportunities, from the summit of Stanage Edge in the Peak District. “The past is a foreign country,” Jan Morris once wrote, “but so is old age”. This is a land many of us are pitched into without forethought or preparation; it happened to me in the 1990s, when my mother, then in her mid-80s, was rapidly developing dementia and also losing her eyesight. I soon discovered that the information I needed was sadly lacking. There were factsheets, certainly, but none of the straight-talking guidance I needed to confront the health and social systems which seemed to obstruct my search for good care for my mother rather than guide me to it. Little help was available to show ordinary people how somebody with dementia and doubly disorientated through near blindness should actually be cared for. This despite the fact that around one in six people over the age of 80 have dementia and one in four of our hospital beds are occupied by people with some degree of dementia. I soon realised that my mother's plight, struggling with memory loss in a small terraced house, accessed up a steep step and without practical help close to hand might have been different had she addressed years before the possibility that she might fall victim to one of the common incurable, chronic illnesses of old age. Choices we make in type and location of our housing, for instance, are just one area in which it is prudent to bear in mind what the future might bring in terms of disability and isolation. My handbook A Survival Guide to Later Life (2004) sought to offer advice on many aspects of later life in fields as diverse as diet for older people, homecare, mobility problems, healthcare, access for elderly and disabled people to the urban and rural environment, housing choices, social connections, financial matters and choosing and living in a care home. After the publication of that book, I gave talks, wrote articles and helped individuals one-to-one. Apart from offering guidance I also put forward considered opinions in such areas as support for family carers, ageism, palliative care and the likely effects of a change in the law on assisted suicide. I was involved in the work of such voluntary groups as the Alzheimer's Society, the Christian Council on Ageing and the Relatives and Residents Association. Since the Survival Guide appeared in 2004, much has changed. It is not only that new laws have been enacted and new inventions transformed the lives of people with disabilities: society itself has changed. Particular illnesses have seen huge change in attitudes - not least dementia. When my mother developed the condition in the final years of the last century, few people seemed to have much idea of what the word dementia meant and little support was available to families affected by the condition. Today, the amount of information and guidance has greatly increased, people with dementia have become more assertive refusing to be called victims, and local people have formed groups to campaign to make their own communities more dementia-friendly. I have therefore rewritten and substantially expanded my earlier Survival Guide to Later Life. How to Handle Later Life was published in September 2017 by Amaranth Books. It offers information and guidance on healthcare, transport, end-of-life matters, help in the home, inheritance, funding care, employment rights, nutritional needs, hospitals and much more.